Buying furniture is an investment for the future, and not something you typically do every 1 or 2 years. That’s why it’s important to get it right when buying, and Oak Furniture Land can help you do just that. Here you will find furniture for your bedroom, living room, dining room, office, beds, dressers, lamps, mattresses, mirrors, cabinets, wardrobes, and much more. Additionally, you can shop for even less by using an Oak Furniture discount code from our website! Having a Problem? 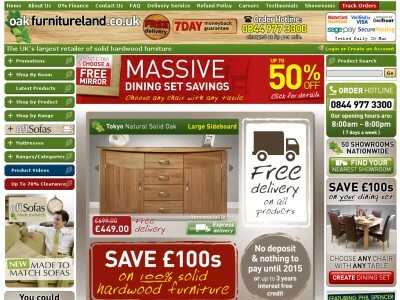 How to Contact Oak Furniture Land Customer Oak Furniture Land Voucher codes – How to redeem? Oak Furniture Land is a company that is determined to deliver products of impeccable quality and original design to its customers. Located in Wiltshire, the company currently employs over 800 people that help design, manufacture, and dispatch timeless furniture to residents of the United Kingdom. The company claims to be the largest UK retailer of hardwood furniture, and has achieved that position after 20 years of existence within the British market. Oak Furniture Land hires specialists that are responsible for processing the many orders for furniture that are placed (around 400,000 per year), and products furniture made of oak, mango, and mahogany. Such high quality furniture can often come with a hefty price tag, which is why customers luckily have the option of using an Oak Furniture voucher code to receive discounts on their orders. The company’s products have a reputation for lasting decades, making their furniture a great choice for the long term. So if you’re looking for furniture that’s built to last, pick up your Oak Furniture Land promotional code and head on over to their web shop today! To find out more about the quality pieces that Oak Furniture Land has to offer, you can subscribe to their YouTube channel. Here you can find more information on the company, sales, products, and much more. Products are Oak Furniture Land are divided into quite a few categories and themes. Rustic, for example, contains 30 products, which include wardrobes, stools, tables, desks, bookcases, and more. The Tokyo collection consists of more state of the art furniture that has been designed in true Japanese fashion. The Alto collection contains tables, chests, sideboards and more, and differs greatly from the previously mentioned products. If solid and timeless furniture designs are something you are a fan of, Oak Furniture Land will have just what you’re looking for. But remember to grab your Oak Furniture Land promotional code before you checkout! Those were just a couple of the many categories you’ll find at Oak Furniture Land. So grab your discount codes and visit there today! Furniture Village is a very popular shop in Home & Garden category. couporando.co.uk will offer you a lot of different online stores where you could redeem coupons and voucher codes and get amazing deals. Such stores are: Oak World, WorldStores . Oak Furniture Land realizes the importance of having a good relationship with their shoppers, which is why they are very active on social networks. You can also follow Oak Furniture Land on Facebook, Twitter, Google+,and Pinterest, to keep up with all the latest news, trends and sales! Be sure to check out these channels regularly, as you never know when an Oak Furniture Land voucher could be waiting for you! If you are satisfied with your choices, you can either continue shopping or click on “Checkout Now”). Enter in your Oak Furniture Land discount code when prompted! Oak Furniture Land wants to help to keep the shopping experience as stress free as they can, and strives to assist their shoppers with any issues or questions they may be having. Oak Furniture Land Voucher codes – How to redeem? Oak Furniture Land has many promotions and sales that you can find directly on the website, meaning that in most cases you won’t even need a voucher code. Should you find an Oak Furniture Land discount code that you wish to use, simply click on it after searching for the shop on our website. You will then be redirected to the Oak Furniture Land website, where you can see your voucher code on the top of the page. When you checkout, the code should be automatically applied before you checkout. If you have any problems applying the code, feel free to contact them directly on the above link. Now that you know all about Oak Furniture Land and how to use a discount code, you owe it to yourself to head on over to their site, browse their wonderful selection of timeless furniture, and breathe some new life into your home! Buy now online at www.oakfurnitureland.co.uk. Whoever is a fan of high quality furniture that you won’t find in every furniture store should check out Oakfurnitureland.co.uk. Not only will you find beautiful handmade furniture, but you’ll also find plenty of ways to save on using an Oak Furniture Land discount code! Oak Furniture Land vouchers are a great way to ensure that you’re saving money when shopping, and are 100% free! Redeeming an Oak Furniture Land promotional code takes only a few seconds, so be sure to take advantage of the savings an Oak Furniture Land discount code can bring today!